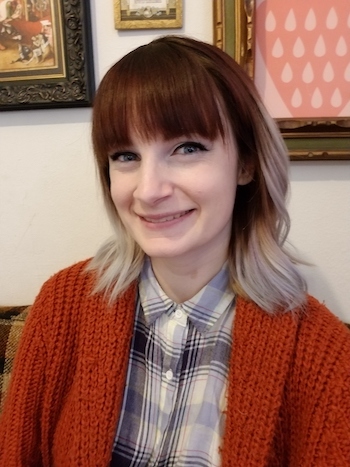 Emily Daley is the Encyclopedia of Milwaukee’s most recent undergraduate staff addition, charged with helping the EMKE expand its website potential by curating digital primary sources to accompany entries. Emily participated this past fall semester in Professor Amanda Seligman’s research-based history course, for which students collaboratively wrote the Community-based Organizations entry for the Encyclopedia. Familiar with the project from this course, Emily wanted to get more involved. Professor Seligman encouraged Emily to apply for a Support for Undergraduate Research Fellows grant through UWM’s Office of Undergraduate Research in order to create an internship opportunity for her. Emily was awarded this grant and now the EMKE is glad to have her on board and benefit from her enthusiasm and experience. As Emily sees it, the project provides not only an opportunity to develop her professional research skills but is also at the intersection of her multi-disciplinary interests in the humanities. Emily is finishing up her undergraduate degree with a double major in both English and History and plans to pursue a graduate degree in Library and Information Sciences, with the goal to become an archivist or instructional librarian within higher education. Emily recently came to UW-Milwaukee after taking time off from her degree. She chose UWM because it is an R1 university that encourages student research at all levels. Also, as a mom to a five-year old, Emily wanted a college community that was supportive of non-traditional students. UWM seemed to be that place—and her instincts about UWM were correct. In fact, Emily explains that her son has been an integral part of her UWM experience; professors have been accommodating about her schedule and have allowed her to bring her son to class when needed so that she doesn’t have to choose between her roles and responsibilities as student and parent. It’s this tenacity and willingness to ask for what she wants and needs that has helped Emily gain valuable academic experiences, like attending the National Conference on Undergraduate Research and joining the Encyclopedia of Milwaukee. So what advice would Emily give to other readers of the Encyclopedia of Milwaukee? Explore! Emily believes the Encyclopedia has lots of relevance to people. While it has a lot of applications for students and researchers, it also provides a resource to Milwaukeeans to connect with their history and to their communities. Emily is particularly excited about some of the forthcoming website features that allow readers to explore the site through digital primary sources and mapping and believes that these features will make the site even more fun and intuitive for readers.